At the start of the Centenary campaign, several donors including the Wellcome Trust and Wolfson Foundation collectively committed £12 million for a building which provides the South Kensington Campus with a focal point for co-ordinating and promoting research interactions between the College’s departments. Research areas include gene therapy which targets lung disorders and cancers, infection at the molecular level and personalised medicine development. The Flowers Building, named after former Rector Lord Flowers (1973-1985), was formally opened in December 2000. The modernisation of our biochemistry laboratories created an integrated research environment housing state-of-the art facilities. The laboratories now house 31 academic staff and research fellows, 120 research and support staff and 83 postgraduate students and research areas include infections diseases and neurodegenerative diseases such as Alzheimer’s. 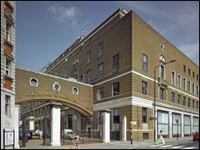 The construction of South Kensington’s Main Entrance and Tanaka Business School was made possible by a £27 million donation from alumnus Dr Gary Tanaka and opened by Her Majesty The Queen in March 2004. The building incorporates the latest construction technology: the roof uses the same type of UV resistant roofing material as Cornwall’s Eden Project, while a sophisticated environmental heating and ventilation system has all under floor heating and cooling powered by waste heat. "We compete on a global stage, and to have a building, as splendid as this, on one of London’s great thoroughfares, sends a message to the world about the role of learning and discovery in this fast changing environment and Imperial’s contribution to that." In the summer 2005 the Department of Materials moved into the newly refurbished Goldsmiths Wing of the Royal School of Mines. This refurbishment programme, supported by The Goldsmiths’ Company, brought together laboratories for research in nanotechnology, fuel cells, metallic materials and biomaterials, as well as areas for teaching and studying. The St Mary’s Campus benefited from its own £30 million redevelopment earlier in the Centenary Campaign, towards which philanthropic donations totalled over £8 million. The St Mary’s Research Building, which houses two Institutes, the Wright Fleming Institute for the study of infection and immunity and the Geoffrey Rose Institute of Epidemiology and Biostatistics, have become the focus for a critical mass of world class researchers in the field of infection, immunity, epidemiology and biostatistics. The refurbishment of the Medical School building included the Sir Roger Bannister lecture theatre, a high-tech teaching environment that can seat 70 students and features a mural celebrating the St Mary’s alumnus’ historic achievement as the first person to run a mile in less than 4 minutes. Today's campus renewal projects equip Imperial to meet and master tomorrow's challenges and opportunities.